In a previous prototype, Sabre demonstrated comprehensive search capabilities using a shopping cache that allowed users to search by both property amenities and room type. This new prototype includes the previous Inspirational Hotel Shopping capabilities but adds another important feature: automatically identification of opportunities for travelers to save money and/or increase availability options by splitting the length of stay across two properties. 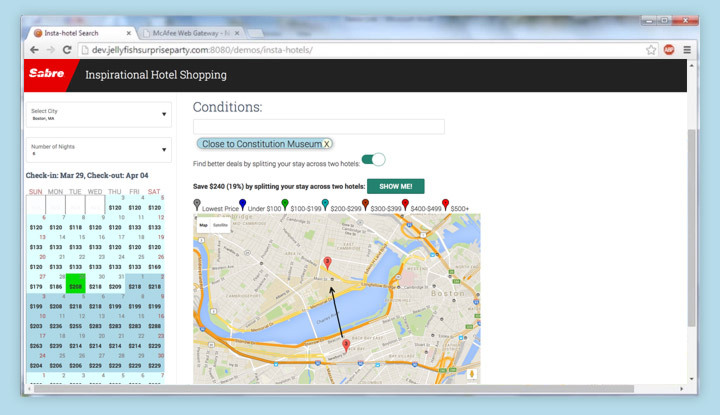 This “split hotel search” capability is seamlessly integrated into the search process. This is an entirely new way to shop and view hotels, and should be of great interest to both travel agents and end consumers by expanding options and providing increased flexibility for specific stays — especially during peak demand times.